Drag and drop files for instant encryption! and safely. Moreover it's completely free! What is Aes Crypter Lite? 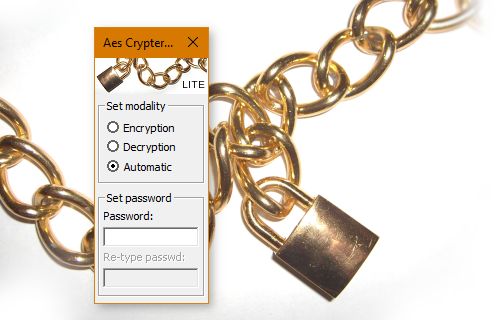 Aes Crypter Lite is very handy to use: once a valid password has been entered, simply drag and drop all files/folders You want to encrypt/decrypt on the interface of the program, and let the software do all the job for You instantaneously and without hardly occupying system resources. - Electronic codebook (ECB): the simplest of the encryption modes. - Cipher-block chaining (CBC): the most commonly used mode of operation. - Cipher feedback (CFB): a close relative of CBC. - Output feedback (OFB): a close relative of CFB. Moreover, data can be compressed/decompressed on the fly before encryption/decryption in order to minimize file system size and increase security. Two versions of the program are provided. Both will run on Microsoft Windows OS on any type of File System You like (FAT16, FAT32, EXFAT, NTFS). Apart from the most classic and easy-to-use Graphic User Interface (GUI) application, a Command Line Interface (CLI) version, very useful to be used within script files, is available as well. Of course, they are fully compatible to each other. Fast as a lightning. All source code is written in C++ with some minimal parts written in ASM (due to performance issues). En/Decoding is up to 5% faster than in the previous release. Moreover Aes Crypter Lite uses the latest and most performance libraries for encryption and data compression. Really easy to use. A fully functional and renewed Contextual Help (Tooltip) will help You at any time and an improved log handling will tell You what's happened on Your files by means of 4 levels of detail. Check out how handy is using Automatic Modality in conjunction with the drag'n drop functionality. Greater security (1/5). Any combination of Key length (128, 192, 256 bits), Block size (128, 192, 256 bits) and Operation mode (CBC, ECB, CFB, OFB) is allowed. This greatly increases safety. Greater security (2/5). All files to be encrypted/decrypted can be compressed/decompressed on the fly using two different algorithms (gzip and bzip2 with user selectable compression ratio). This allows both to minimize data size and to greatly increase safety, complicating data reverse engineering. Greater security (3/5). Both temporarily data created at runtime and original files not useful any more, can be automatically deleted by using Wiping technology with user selectable steps: for each of them, files will be overwritten using three different patterns. Greater security (4/5). The original name of each file that is going to be encrypted, is stored inside the new file. By doing that, You are allowed to change the encrypted filename whenever You like, because Aes Crypter Lite will remember the old name during the decryption phase. Changing the name of the file prevents someone to guess the contents of the file by looking at its name. Greater security (5/5). All filenames can be automatically renamed on the fly during the encryption phase by using SHA1 algorithm (in order to miminize name collision within the same folder) and automatically restored during the decryption phase. Do not worry about the size of Your file. The dimension of each processed file can be up to 4 GBytes, while the size of all processed files, for each session, can be up to 2 TBytes. Select the right files at the right time. A pattern-matching string can be set in order to select the files You really need to encrypt/decrypt/compress, keeping all other files out. File System independent. Aes Crypter Lite can use all Microsoft Windows File Systems natively: FAT16, FAT32, EXFAT or NTFS on any read/write device You like (i.e. USB Storage device). Two versions of the program. Both GUI (AesWin) and CLI (AesCli) versions of the program are available. By sharing the same engine, they are fully compatible to each other. The compatibility with the previous release has been preserved as well. Minimal system resources. Aes Crypter Lite needs minimal system resources regarding both hard disk storage (less then 6 MBytes) and runtime execution (less than 2 MBytes/RAM regardless of the size of processed file). It's free. You are FREE TO USE this application by respecting the Licence Agreement. Aes Crypter Lite can be run over different releases of Microsoft Operating Systems. - For all OS versions, Aes Crypter Lite is going to use less than 2 MBytes/RAM during runtime regardless of the size of processed file. - Aes Crypter Lite takes up less than 6 MBytes on File System. - All Microsoft Windows File Systems are allowed to be used: FAT16, FAT32, EXFAT, NTFS. - Of course it's mandatory to have a mounted read/write file system in order to save encrypted files.